There are clearly two kinds of applications – two major classes of applications. The big scientific/engineering research, which is largely mathematical in nature, [and] then there is the large data-processing world, which is largely arithmetic in nature. So, we never really designed computers for either world, because we wound up building von Neumann computers. And until we look at the data, we will not come up with a new articulation. I've been thinking about data flow and the different kinds of data flow. Now, sometimes data flows like that lava out in Hawaii, sometimes it's like a marching company of marines: organized, disciplined. [And] sometimes it's more like the flow over the wing of an airplane, which gives the lift and has the turbulence to fly, too. We've never looked at the data, how it arises and how it flows. I think as we build these systems to compute, we'll become more aware of types of data. For instance, the scientific/engineering field doesn't give a hoot about an alphabetic character. It is largely binary and floating. In data processing it's integers and add, subtract, multiply and divide: only arithmetic and comparisons of those alpha-decimal characters. We haven’t looked at the amount of work done on data. Long ago, in the earliest computers , we discovered that you could always go faster if you had more space, more storage. We've never looked at the value of data, the value of an education. Well, some stuff going through the computer is a heck of a lot more valuable to us than other stuff is. Nobody has ever gotten a little bit philosophical about the value of information: All information is good; put in the computer and run it over the lines. We need to look at the stuff and what we can afford to lose, what can't we afford to lose. Part of it's just a relic of the past, and so on. With just a narrow look, we've taken these lovely computers, faster transistors, everything under the sun, better language, more software – pile it in. We never think of what we're doing it on. I think until organizations begin to look at the information, as long as they look only at the computers and telephone lines that they control, they´re not doing there job. They´re not looking at the information itself. They´re not looking at the value of the information. They´re not looking at who uses it and why, the kind of information, what it does, where it comes from. The value is a big thing we´ve never looked at." (1990). 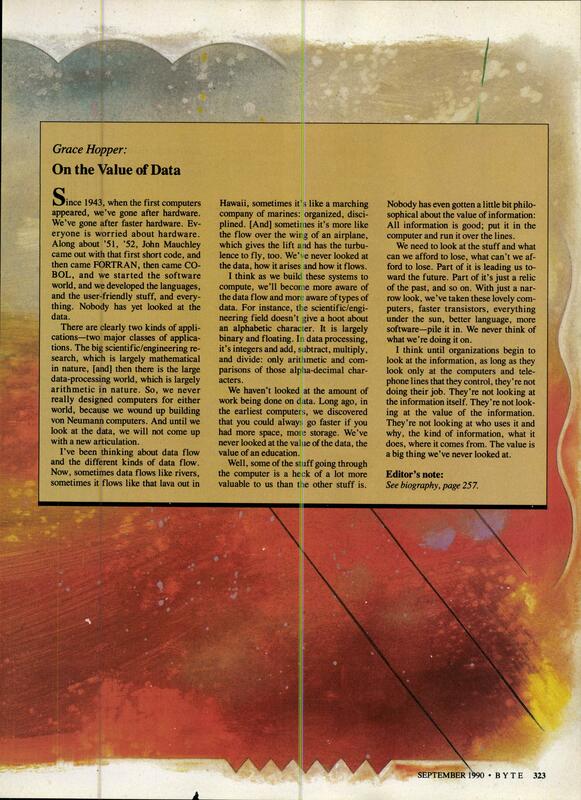 On the value of data.